Its from the Warcry trailer. Looks like Darkoath will feature is this skirmish game. So I posted this on the Legends of the Painty Men thread but thought it should go wider. GW officially produced music only I'm afraid is all that is sanctioned, anything else is Heresy - I got this vinyl back in the day and thought it was amazing, the slip book had loads of classic 40k and realm of chaos artwork. Still have it at my parent somewhere. He would fit right in with the elves from Disenchantment Elfo, Weirdo, Superviso, Shocko, Worko, Speako, Leavo.......Zalbo? Also Andrew if you haven't caught it already Matt Berry has some great lines as Prince Merkimer. Dont think anyone has posted this yet but GW NZ just posted images from White Dwarf and you can see the models for the Goblins. https://www.games-workshop.com/en-NZ/White-Dwarf-October-2018-eng looks like 7 goblins (Shaman, fanatic, netter, herder, 3 archers) plus 2 squig Guessing these and Tzeentch will only be a couple of weeks away. GW Terrain - what do we want, what's reasonable? I personally feel they should/will move away from the generic medieval Europe look and hope they produce much grander fantastical scenery. Most gaming tables are littered with very old world looking pieces, nothing wrong with that and those places should exist in the mortal realms but looking through the new lore and art the realms have so much more to offer. Black Library Audible release shedule? I was wondering if anyone here has any insight into the oddity that is Black Library releasing their audio books/dramas on Audible? I'm greatly enjoying the fact that they have so much of their catalogue on there now, but find how soon some of the newer releases get put on the service a bit random, specifically on the AOS side. A lot of the 40k and HH stuff gets put up straight after its on BL but there is a bunch of stuff I would love to listen to which hasn't appeared. 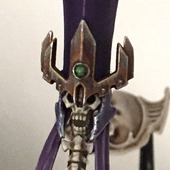 For example Soul Wars and Nagash - The Undying King have not made an appearance, The Darkness in the Glass is on Coming Soon but strangely The Silver Shard was available straight away. I contacted BL already but never got a response. This sounds a little impatient on my part but really I'm just wondering and would even be willing to buy directly from BL if I knew these titles were not coming to audible but kind of expect them to appear the second I do this. Have to say Audible was a great way to get deeper into AOS fluff and would recommend to all, also been drawn into the Heresy while waiting for more AOS. Amazing podcast, your explanation of what warhammer is for the uninformed is both spot on and hilarious. Also as a Brit living in LA the Harry Potter accents were much appreciated Keep them coming. So I noticed all the unit warscrolls shown in the previews say "A unit of .................. has any number of models." This is different from previous warscrolls in that most had a minimum number stated (Liberators 5, skeletons 10...etc.) Now this may just be because they are part of the starter set and we will still see a min/max in the generals handbook. But it does make me wonder if there will be a more granular points system allowing individual models to be added to units. Just realized why I'm getting a bride theme from this model, the head dress and rose thorns are stylized like Tim Burton's Corpse Bride. This must have been an influence on this range. So it looks to me like the Mortarch of Grief will be dressed in her wedding/mourning dress. I'm guessing wedding as she is flanked by the two spirits like brides maids. The spirit on the left can be seen in the original trailer carrying the broken time glass, you can also see the white of the flowing parts of her dress. I'm sure people have spotted this already and I'm guessing there wont be models related to these, at least for now, but just seen the flying whale and giant tentacles on the cover of the Deepkin book and thought there is a lot of potential there for big sea monsters at a later point. Know anything is possible in the Mortal Realms but those are fish swimming through the ship's beams? 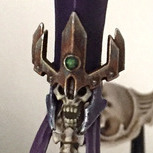 Confused by this one as would not expect so much Sigmar iconography if part of an Aelf release, feel they will have their own even if part of order. I'm swaying more for scenery, but think it will be part of a release.